FACT CHECK: Is the Green Party on the Ballot in All 50 States? Is the Green Party on the Ballot in All 50 States? As of September 2016, Jill Stein was on the ballot in 45 states. Jill Stein, the Green Part's presidential candidate, is not yet on the ballot in every state. After the major political parties’ national conventions concluded in July 2016, Green Party candidate Dr. Jill Stein drew the attention of many disaffected progressive voters, prompting inquiries about whether Dr. Stein and the Green Party had secured ballot access in all 50 states. Stein’s candidacy hit a definite tipping point after Sen. Bernie Sanders endorsed Hillary Clinton, triggering a voter shift dubbed “Demexit” by some participants. But while Sanders sought the nomination of a major party, Stein (often lumped together with Libertarian candidate Gary Johnson) mounted a third-party run without automatic universal ballot access. We’re already on the ballot in 23 states (including the District of Columbia). But we need your help to get on the ballot in the remaining states listed below. A list of Ballot Access Coordinators can be found here. High-priority states are Connecticut and New Hampshire. If you live in a state where we’re already on the ballot, you might be allowed to travel to a neighboring state to petition—if the state law allows. Please check in with the specific state’s coordinator(s) to find out and to plan. Ballot access was also achieved in Vermont for the first time ever. Over 1400 signatures were submitted that had already been certified as valid by town clerks across the state. 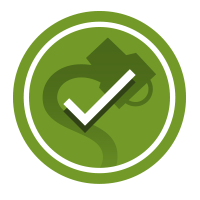 The Green Party now has ballot access in 23 states, are awaiting government certification for 9 more (including the six states mentioned here), and have active petition drives in 15 more states. Presumptive presidential nominee Jill Stein will be formally nominated by the Green Party at the party’s national convention in Houston on Saturday, August 6th. The Green Party is actively petitioning to be on the ballot in at least 47 states for the general election in November, enough to potentially win an electoral college vote. Voters now confronted with the choice between Hillary Clinton and Donald Trump are making something abundantly clear: They want another option. Surveys over the last six weeks have found a steady but noticeable jump in support for third-party candidates. The biggest beneficiary has been Libertarian nominee Gary Johnson, who has shot up from 4.5 percent to 7.2 percent in RealClearPolitics polling averages. Green Party candidate Jill Stein has also seen an uptick since June — from 2.5 percent to 3.5 percent. The surge in support for a third-party candidate is adding a new element of unpredictability into the presidential race. Should voters opt for a third-party candidate in large numbers, it could potentially tip the scales in crucial battleground states. Pollsters and political scientists say the deep malcontent with Clinton and Trump should give both candidates pause. “The fact that we have two major party candidates who are enormously disliked by the electorate, enormously and equally disliked, creates the opportunity for the minor party candidates to do better than they would in other presidential elections,” said Peter Brown, assistant director of the Quinnipiac University Poll. Patrick Murray, the Monmouth University pollster who was the first to put Johnson on a national poll, said that he doesn’t think voters are viewing third-party support as an ideological choice. Johnson has received significantly more media coverage than Stein, taking to cable news to tout the potential endorsement of 2012 GOP nominee Mitt Romney. Murray and other pollsters believe that he may be seen as the de facto third-party candidate for those looking to lodge a protest vote. “For those who really feel they cannot vote for either of the two major party nominees, Johnson is nominally the most visible alternative,” Murray said … Utah is fertile ground for Johnson right now, as an internal poll from Republican Rep. Mia Love’s campaign found him just 3 points behind Trump and 1 point behind Clinton, according to the Salt Lake Tribune. 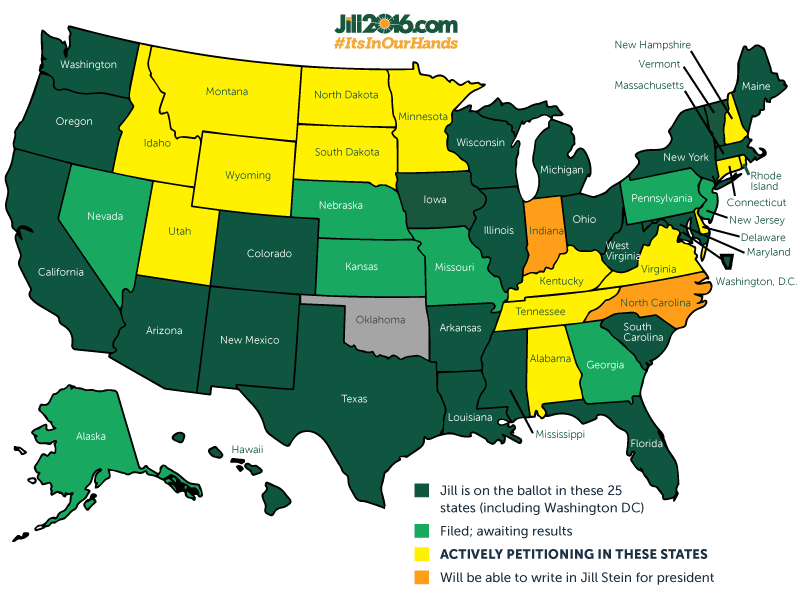 As of 2 August 2016, the Green Party and Stein’s ticket have ballot access in 23 states. Libertarian Party candidate Gary Johnson is set to appear on all 50 state ballots, but he has yet to achieve the 15 percent polling level required to appear in televised presidential debates. September 10 update: Our petitioning drive in all states has ended. Americans in 48 states (including DC) are able to cast a vote for Stein/Baraka on November 8. We’re on the ballot in 45 states (including the District of Columbia) and are qualified for write-in status in another 3 states, for a total of 48 states in which a vote for our campaign will count. The Hill. 31 July 2016.